Universal Classic Toys Inc. is an online company specializing in Movie & T.V. 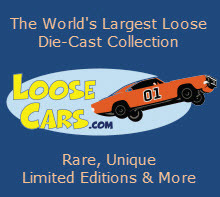 collectibles, Die Cast, Hollywood Memorabilia and a variety of special Limited Editions that enhance collectability at great value. At Universal Classic Toys, we strive to make your shopping experience as relaxing and enjoyable as possible. Browse through our online store, there’s sure to be something that catches your eye. We do our best to offer items in each price range for everyone's budget. You can find fun and variety of special items available always, even if you don't have a lot to spend! We are always updating and improving our online store, should you have a question or suggestions about our product or web site or even want to Sell your collection, please email us, we are here & we would love to listen. We ship Fast, Pack Well and save you money on shipping with multiple purchases. Thank you for Shopping with Universal Classic Toys.